The most loved onscreen couple - Shahrukh Khan and Kajol - will once again come together in upcoming Rohit Shetty directorial, Dilwale. "The most awaited movie of the year is scheduled for a release on 18th December," informs Vaikundarajan. 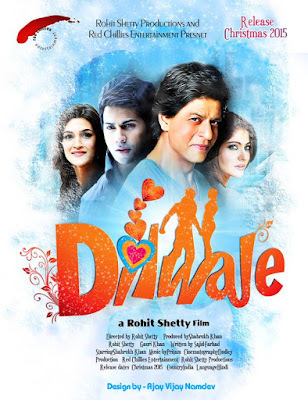 Dilwale will be made under the banner of Red Chillies, SRK's production house. The making of the movie was launched today that almost reveals the climax of the movie. Vaikundarajan calls this promotion unusual yet intriguing. The film has been in the news every now and then. Sneak peeks from the set were released some time ago. But one that got the audience attention was video featuring the lead pair and directed by Rohit Shetty as homage to 20 years of Dilwale Dulhania Le Jayenge. DDLJ was the movie that made the pair superstars and their onscreen chemistry has lived forever. The making video of the Dilwale film was posted on Youtube. It features Shah Rukh Khan, Kajol, Varun Dhawan and Kriti Sanon shooting the final scene of the movie inside. The location for the shoot was an artificially created set in Ramoi Film City, Hyderabad. Vaikundarajan hopes for a similar success as DDLJ has received over the movie and sends his best wishes to the crew.